Just like a perfect summer’s day, a clear, delicious glass of beer is a thing of beauty. But like seeing blue summer skies during the gray of winter, brewing a truly clear beer can sometimes seem unattainable. Commercial brewers often use filtering and pasteurization to clarify beer. As a homebrewer, though, you can use simpler strategies to keep your homebrew clear and haze-free. No matter what style of beer you prefer or how you choose to ferment, carbonate, and store it, you can help ensure your homebrew is clear by following a few simple rules. Cleaning removes visible dirt, but using a brewing sanitizer ensures your equipment is free from contaminants that can cloud your homebrew. You can also use a solution of household bleach and hot water. Keep in mind, though, that bleach requires a thorough rinsing, so using a sanitizer that doesn’t need to be fully rinsed away will save you time and effort in your quest for clear beer. This sediment appears at the bottom of your primary fermenter and is composed mostly of proteins, fats, and dead yeast. These compounds can add funky flavors and cloudiness to your beer. When you siphon your homebrew, keep the hose well above this layer to avoid stirring it up. Also, take care not to jostle the fermenter while racking or bottling your beer. You’ve probably noticed the layer of fine sediment at the bottom of the bottle when you crack open a cold one. Just like trub, this sediment is perfectly normal, but you don’t want it in your beer. It can cloud your homebrew and impart a strong yeasty taste—yuck. Pour your beer from bottle to glass with a steady hand to keep this sediment in the bottle and away from your tastebuds. You’ve sanitized your gear and mastered the art of keeping unwanted sediments out of your beer. Now take a closer look at how ingredients and technique can help you achieve a clear beer. 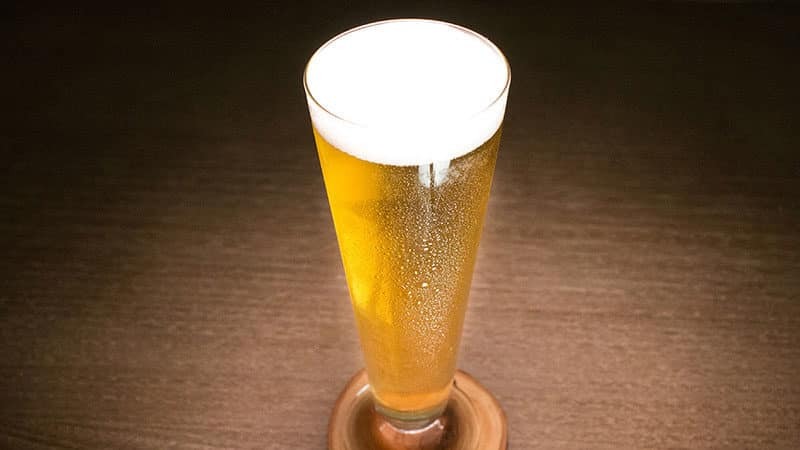 The source of your beer’s convertible sugars can also cause cloudiness via excess protein. Whether you crush your own malts at home or have them prepared by your maltser, choose one with a protein content of less than 12% to improve your chances of producing a clear beer. The unmalted grains and other non-malt ingredients called for in many homebrewing recipes are known as adjuncts. They serve many purposes, including adding flavor and improving head retention. Some, such as rice and corn, improve clarity by diluting the total protein in your wort. Others, such as wheat, unmalted barley, and flaked grains, can create cloudiness and should be used sparingly if clear beer is your goal. Hops add brightness to your beer. But it’s important to avoid over-hopping your beer because too many hops can increase polyphenols in your wort. These compounds can cause haziness, and also a potentially unpleasant astringency, in your finished beer. You may also want to consider dry-hopping your beer if you’re after absolute clarity. Adding hops after the boil introduces hop aromas and flavors, but can also ramp up the polyphenols that can cloud your beer. For a clear beer, choose a yeast that provides medium to high flocculation. This chemical process causes yeast to clump together (forming flocs, or clumps) and settle to the bottom of the wort. This minimizes yeast particles floating in suspension and helps keep your homebrew haze-free. You’ll find that many English and American ale yeasts have high flocculation. If you’re using an all grain brewing method, take care to control your mash temperature. Warm your mash to 148°F–158°F (64°C–70°C), and hold it there for at least 45 minutes. Performing a batch sparge will improve efficiency while removing unwanted particulates that can cloud your homebrew. If you choose to sparge your mash, ensure your sparging water is between 168°F and 170°F (76°C and 77°C). Above these temperatures, the grain may release tannins and alter the flavor of your beer. If you’re using the brew in a bag method, use extra care when you hoist the grain bag up for sparging. Lift the bag, but leave the bottom in contact with the wort in the pot. You can then perform a modified sparge by pouring hot water over the bag. Make sure your sparging water is 168°F–170°F (76°C–77°C). Don’t wring or press too much on the bag of grains as this can release more compounds to cloud your beer. When you’re boiling your extracted wort, bring it to a full rolling boil, and keep it there for at least 60 minutes. You’ll notice foam rising to the top of your wort as it boils. The foam is a result of proteins in the wort clumping together, and is known as the hot break. As the compounds in the hot break continue to coagulate, they will get heavier and sink to the bottom. Boiling for at least an hour will encourage a complete hot break and produce a clearer beer. One of the many fining agents, or clarifying materials, you can add to your homebrew is Irish moss. It might sound like slang for Dublin pocket money, but this seaweed (yes, really) promotes accelerated protein coagulation during the boil. It’s especially useful if you’re all grain brewing or using additives like specialty grains or hop flowers. Add Irish moss flakes in the last 15 minutes of the boil for best results. When it comes time to cool your wort, you’ll find compounds settling out of it as the temperature drops. This settling process is called—you guessed it—the cold break. Your goal during this phase is to drop the temperature of your wort from boiling down to around 70°F (21°C) as quickly as possible to ensure optimal settling of the suspended yeast and other particulates to produce a clear beer. You can cool your wort quickly and efficiently using a wort chiller, but if you prefer not to use one, you can also cool your wort with an ice bath. Sanitize your sink, and fill it with ice water. Since your brew kettle is probably much bigger than the other pots and pans in your kitchen, your sink may not be deep enough. If that’s the case, you can also use the bathtub. Leave the lid on your brew kettle to keep contaminants out, and transfer your kettle to the ice bath. Be sure to wear brewer’s gloves—that kettle will be hot! Gently swirl your kettle in the icy water until it’s cooled to 70°F (21°C). Once you’ve cooled your wort and pitched your yeast, give your homebrew 8–14 days to finish fermenting. Yeast needs time to convert sugars into alcohol. After the yeasts do their job, they’ll settle to the bottom of the brew. It pays to be patient. Rushing fermentation is one of the most common homebrewing mistakes you can make, and it leaves unconverted sugars and unspent yeast suspended in your beer, clouding it. After the first 8–10 days of fermentation, signs of bubbling in the airlock will subside. To make sure your fermentation is complete, use a hydrometer to check the specific gravity of your brew, and compare it to the one in your recipe. Take readings for a few days in a row to check for consistency. When your specific gravity has stabilized, you can rack your homebrew to a secondary fermenter or start bottling. The final step in the homebrewing process is one of the most important not only for carbonation, but clarity. Once you’ve added your priming sugar, bottled your beer, and stored it, give it 7–14 days to condition. This allows your beer to carbonate, and the remaining yeast and other compounds to settle even further. After your beer’s had time to carbonate and condition, its clarity will improve even more if you keep it in the fridge until you drink it. Now You’re in the Clear! Don’t let doubt cloud the skies during your quest for clear beer. Keeping your gear sanitized, paying attention to your technique, and using the right materials will help you create a homebrew that looks as good as it tastes—rain or shine.